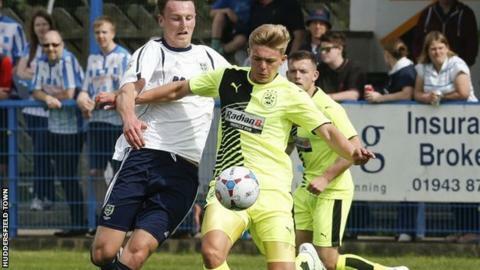 Guiseley have signed Huddersfield Town forward Jake Charles on a one-month loan deal. The 19-year-old, who made his Town debut in the defeat by Fulham in March, is the grandson of former Leeds and Wales striker John Charles. He could make his debut for the Lions against Welling on Saturday, 8 August. "I know Chris Powell thinks a lot of him and we're sure he'll add extra quality and strength in depth," boss Mark Bower told the club website.